Builders accused of mis-selling new homes are braced for legal claims worth millions of pounds after locking buyers into leases with spiralling ground rent charges. Sajid Javid, the communities secretary, this week announced plans to ban homebuilders from selling new houses on a leasehold basis. The Times today considers how the ground rent scandal will be resolved, referencing possible class actions against developers or conveyancing solicitors. Or both. “Solicitors who failed to flag up the conditions of these contracts to clients buying the homes are also braced for a wave of professional negligence claims. The article featured Lisa Chapple, 34, a hospital occupational therapist from Prescot, Merseyside, and her husband Ray, 35. Her ground rents are £250 a year doubling every 10 years, stating from last January. Mrs Chapple is among thousands of Taylor Wimpey ex-customers who have rejected the supposed “£130 million” ground rent relief scheme of Taylor Wimpey. It is only open to those who contact the company. 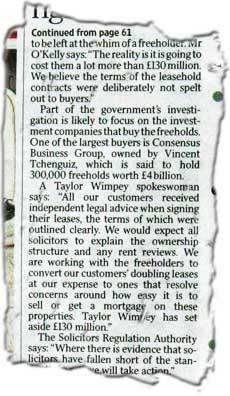 Taylor Wimpey is quoted saying that all customers “received independent legal advice”. Suppose Taylor Wimpey secure changes to the doubling ground rent charges so that for new build original owners it reverts to RPI? It is claimed that this will alleviate the problems of selling the property on. 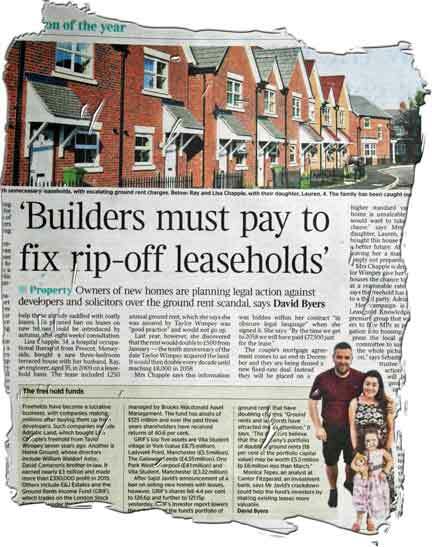 But if Taylor Wimpey now stop the sale of leasehold homes , they are actually putting the “owners” of all leasehold homes in a worse position. Peter Redfern may claim that rectifying this problem will cost 130,000,000 pounds. I reckon such is the mess 1 billion is nearer the mark! Take note shareholders! Yes, that is correct, for every leaseholder TW helps there will be many more put to a far bigger disadvantage. So TW must help every purchaser of one of their leasehold houses., including Sell ons and they need to contact all the “unawares”. With the events of the past week, the value of Freeholds must have devalued considerably to these Finance Companies, so TW should be able to negotiate a reasonable buy back price. They can then be sold back to the Leaseholders at a fair price. This would be TW’s cheapest way to get out of the hole they have got themselves into. Their current solution will not satisfy many victims and will result in prolonged legal battles and enormous cost and anxiety to all. It is said that freeholders are looking for a return on ground rent income of around 7%. It may be of interest to note that the recently re-financed part of the Tchenguiz property portfolio means that interest of 4.5% is payable to the new investors. That is giving a margin of 2’5%. Therefore the bulk of earnings must come from administrative fees or late payment charges. this is something the freeholder is allowed to recover their costs for, but crucially are not meant to profit from. Developers and greedy land grabbers who call themselves “investors” have created a perfect storm and a bubble that will burst just like the 2008 bubble. I just hope we, the legitimate property owners who work shifts and 2 jobs to stay afloat listed by T.May as the JAM’s will be bailed out, not the banks this time, hedge funds, pension funds who will be hit by the result of the storm. All properties with the land they stand on should be off-limits to investors, as we have learned in the past what comes out of that kind of mix.